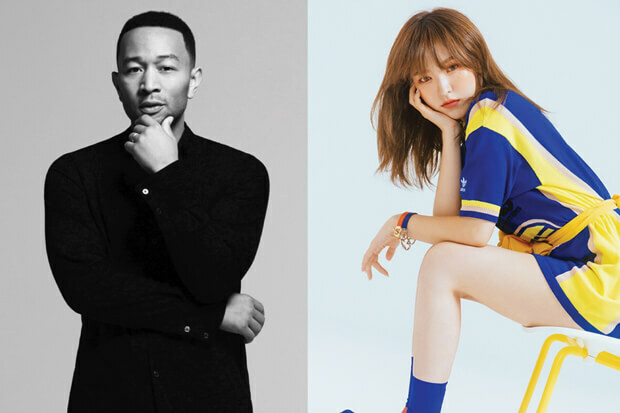 John Legend Links Up With Red Velvet's Wendy On "Written In The Stars"
UPDATE: “Written In The Stars” has arrived, and it is a beautiful love song. Give it a listen and check out the cinematic video below! John Legend is keeping very busy this month. The EGOT winner already revealed plans to drop a holiday album called A Legendary Christmas October 26. But before then he will link up with Wendy of K-Pop girl group Red Velvet on a song called “Written In The Stars.” They got together to announce the collab over the weekend and confirmed an October 19 release date. Although we don’t know much about the duet just yet, it sounds very promising. In a press release, it was described as an English-language track “about true love always finding a way.” They also shot a music video in a Southern California desert, which promises to be an exceptionally glam affair. “I have been such a fan of John’s work for a long time, so to collaborate with him on this project was a dream,” Wendy added in the press release. “Everything John does, he approaches with excellence, and I can’t wait for fans to see this soon.” Earlier this summer, the hitmaker and the rest of Red Velvet dropped their Summer Magic EP, which featured their first all-English track, a rerecorded version of their song “Bad Boy.” Since dropping in August, the version has been streamed more than 4 million times on Spotify. I’m hoping that “Written In The Stars” is a soulful ballad, but we will have to wait until October 19 to know for sure! In the meantime, revisit Summer Magic and check out their announcement below!